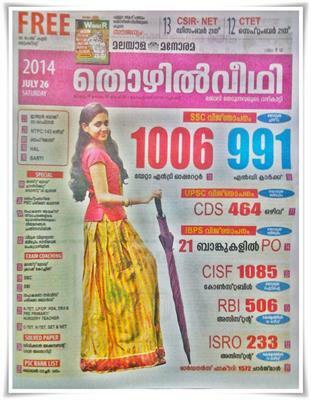 Malayala Manorama Thozhilveedhi, a leading employment newspaper in Kerala has published its 26th July 2014 edition. The current issue of 'Thozhilveedhi' is packed with a lot of opportunities for the job seekers. The highlights of this issue are the arising vacancies in Indian Bank, NTPC, Brahmos, HAL, BARTI, Notifications of SSC, UPSC, IBPS, various opening in CISF, RBI and ISRO. Crash coaching for Last Grade, SSC, SBI, Cooperative Service Society, K –TET, C-TET, K-TET and SET exams are also featured in this issue. Prospects from various Universities, Colleges and Schools are also reported. While going through the pages, 251 officer vacancies in Indian Bank, 143 opening in NTPC, 233 in ISRO, 506 Assistants in RBI and 1085 constables in CISF are also given in the current edition. According to the SSC notification 1006 data entry operators and 991 LD Clerk vacancies are reported. The IBPS notification 2015 for 21 banks would enable the candidates who wish to make a career with banking. Solved papers of Kerala PSC Division Accountant, PSC rank list of Tribal watcher (Forest) is published for reference. Special crash coaching for for Last Grade, SSC, SBI, Cooperative Service Society, K –TET, C-TET, K-TET and SET exams would be beneficial for candidates who are preparing for the exam which would take place after August 2014. The exam coaching for SBI exam prepared by Time Institute is will be beneficial for the candidates. The Kerala PSC September exam calendar is given in this issue. The hall tickets for the last grade exam to be conducted in September can be downloaded from 30th August. Special focus is given to General Knowledge as it forms the part of almost all exams conducted by the Kerala PSC. Job seekers can best use this issue of 'Thozhilveedhi' to apply for suitable employment vacancies depending upon their ability. More than being an employment newspaper, 'Thozhilveedhi' has become a companion for millions of youngsters who wish to build up their career. 'Thozhilveedhi' is considered to be an effective platform for job vacancies and career preparation. Being one of the popular newsweekly among the job seekers, 'Thozhilveedhi' is widely circulated in Kerala with more than 1 lakh prints. So read this issue of 'Thozhilveedhi' and make your dream come true.